Announcement Aloha and welcome to my store! Do you have a great idea and need somebody to make it into reality? You're in luck, because that's my specialty! Send me a message and let's talk! I can work within your budget and take payment plans. 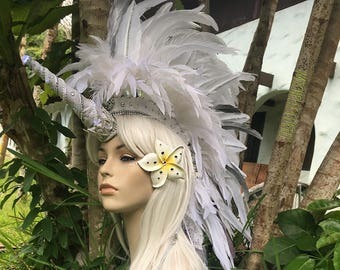 Most of the headdresses that you see in my store are made to order and are displayed as design ideas as to what I can do. However - I always welcome new ideas that I've never dreamed of! 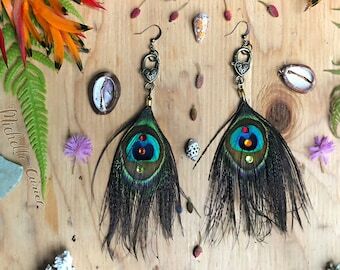 All art and feather creations that I make are made with love and aloha! Aloha and welcome to my store! Do you have a great idea and need somebody to make it into reality? You're in luck, because that's my specialty! Send me a message and let's talk! I can work within your budget and take payment plans. 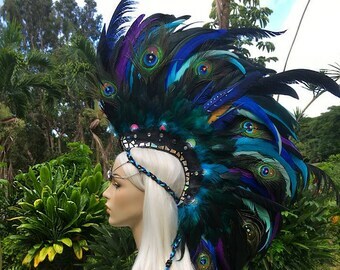 Most of the headdresses that you see in my store are made to order and are displayed as design ideas as to what I can do. However - I always welcome new ideas that I've never dreamed of! 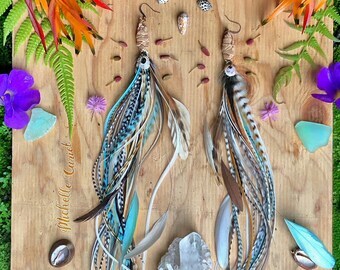 All art and feather creations that I make are made with love and aloha! 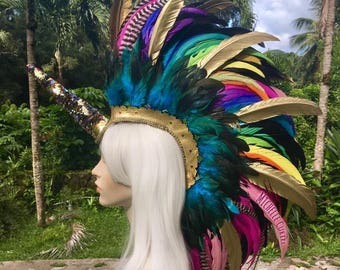 Made to order: Unicorn Feather Mohawk Headdress - "Malani"
Amazing ear cuff for our Carnaval themed fundraiser. Very well made & comfortable to wear! Lots of compliments all nite long! Thank you! The Dirty Bird Bag of Tricks worked great for some wing feathers I had. But I want to talk about my custom order for a headdress that Birdie made for me. 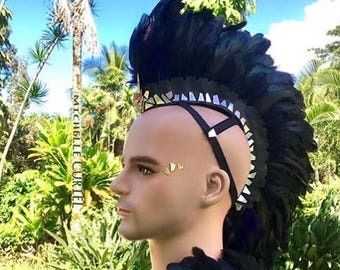 This headdress is special because it incorporates both North American and South American cultural shamanism. I added the eye mask, but will need to get a darker red or black fringe. 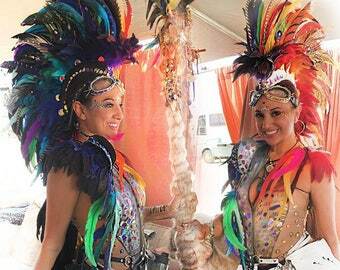 I can't say enough about this headdress! It is perfectly beautiful. I wish everyone could see it in person. Thank you Birdie! I will be ordering from you again! I wish I had words beautiful enough to describe my headdress and this shop owner, Michelle. 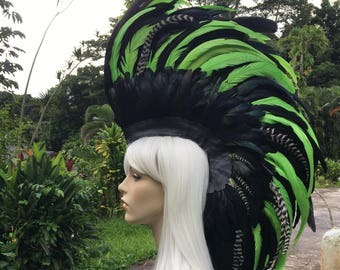 Michelle designed the headdress for my jungle-themed, costume wedding -- a cockatoo. The piece had intricate pearls, a leather overlay on the clip, MANY feathers, and IT LIT UP via remote. It was amazing. A true work of art. I felt beautiful. I sincerely wish I could wear it every day. Michelle made my tight deadline, and worked around the clock to make me happy. She is thoughtful and puts incredible effort into her work. You should, without a doubt, but your headpiece from Michelle. 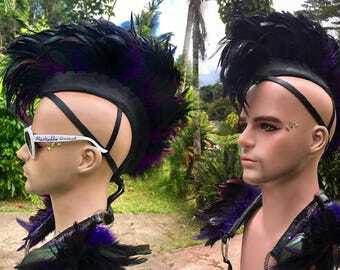 It's a clip and it's light, even though she fills it with beautiful feathers. My hairdresser put it in for me, but I'm sure I could do it alone - especially because Michelle will send you many videos and instructional PDFs. Aloha & thank you for stopping by! My name is Michelle Curiel, but you can call me Birdie! 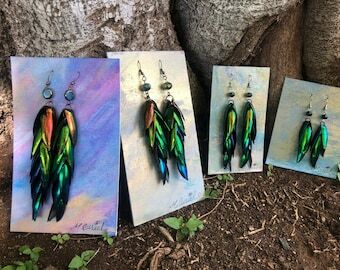 I currently live on the beautiful Hawaiian island of Oahu, making beautiful colorful art in a variety of different mediums, namely feathers! 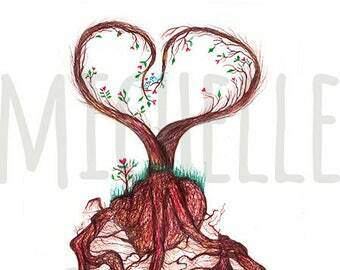 If you know anything about me, you know that I live and breath art in everything that I do everywhere I go. Constantly inspired by my surroundings, I express my innermost feelings through art. I live by the belief that beauty resides within us regardless of circumstance. This beauty is love, creativity and inspiration. You can find it if you look for it with your heART.